Obituary – Russell, Theda Maxine (Oden) « Perry High School Alumni Association, Inc.
Theda M. Russell (Oden) passed away suddenly on Saturday, August 22, 2009. She was born on March 8, 1920 to Brent D. and Olive Oden. 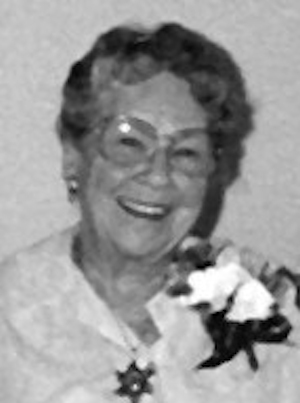 Theda, known by all who loved her as Mickey, grew up in the small, friendly north-central Oklahoma town of Perry where she participated in a number of activities and was very active in the Eastern Star. Late in the summer of 1938, she met the love of her life, John M. Russell, and after a whirlwind courtship, they married in Laredo, TX on September 6, 1938. From that moment, until the moment of her death, she and John were always together, often holding hands like teenagers, except during his service in World War II and a short period when John’s work took him to Venezuela. Together, they lived in some exotic (Alexandria, Egypt) and not-so-exotic places (Ely, NV). The most important thing to her was that she and John were together. Along the way, she bore and raised two sons, John M. Russell, Jr (wife, Janice R. Hall) currently residing in Fayetteville, NY and Brent D. Russell (deceased). She also had two grandsons, Joshua C. (Austin, TX) and Gregory M.G. (San Diego, CA) Russell). She and John moved to Casper in 1959 and then to Glenrock in 1986. She always said after all those years she considered herself to be a Wyoming native. While in Casper, she worked for 18 years as a drapery specialist, retiring from that in 1982. Besides her son and two grandsons, she is survived by the love of her life of nearly 71 years, her brothers Dee (Nadine) and Corky (Cathy) Oden (both of Perry, OK) and her sister, Jean Long (Enid, OK). Funeral services will be held Friday August 28, at 11:00 AM in the Glenrock Fundamental Baptist Church 125 S. Seventh, Glenrock, WY with burial to follow in Glenrock Cemetery. Newcomer Funeral Home is in charge of arrangements.